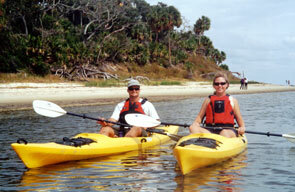 Wild Florida Adventures - Guided Kayak Tours on Florida's Nature Coast. Explore Florida's scenic Gulf Coast over glistening shallow water among coastal islands often rimmed by white sandy beaches. Knowledgeable guides will introduce you to the estuaries at a leisurely pace with time to explore beaches and tidal creeks. View birds and other wildlife that are abundant throughout the Lower Suwannee Refuge and Big Bend area. Half day tours are $50, but can vary by destination and number in the party. Sunset and Moonlight tours also available. For specific information read about all of our trips. No prior experience necessary! Call us at (352) 215-4396!